Here is my talk, together with a great visualization provided by the conference organizers. Classes of service do apply when developing products. Kanban doesn’t prescribe teams, but what kind of team formation / organizational structure works best? Explored several options and their attributes and effect on Flexibility, Resiliency, Performance. Kanban principles and practices scale, in a fractal way. You can zoom in and out as you wish. The higher you go, the tougher it is to feel a day to day flow, which is the main challenge of Kanban at higher levels IMHO. PS If you were at the talk, I’d love your feedback! 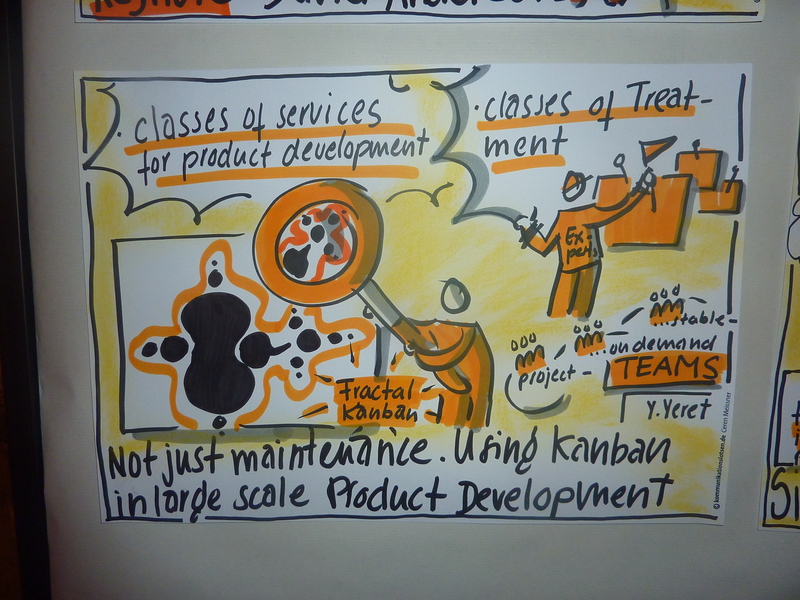 This entry was posted in Events, kanban and tagged Classes of Treatment, Fractal, kanban, LKCE11, Scale, Teams on October 18, 2011 by Yuval Yeret.